Hello crafty friends! I hope you are enjoying a good start to the week 🙂 Today – and on the 15th of every month, marks the start of a new challenge at Scrap N’ Dipity. The challenge this month is ‘Anything Goes’ so you can use any of the fab images available in the store and let your imagination run wild! You can check all the rules for our challenge on the Scrap N’ Dipity challenge blog – Scrap N’ Challenge. As long as you use one of Alisha’s super images and link up on the blog on or before the 14th of next month, you could be in with a chance to win a digi stamp from the store! There will be a 1st, 2nd and 3rd place! 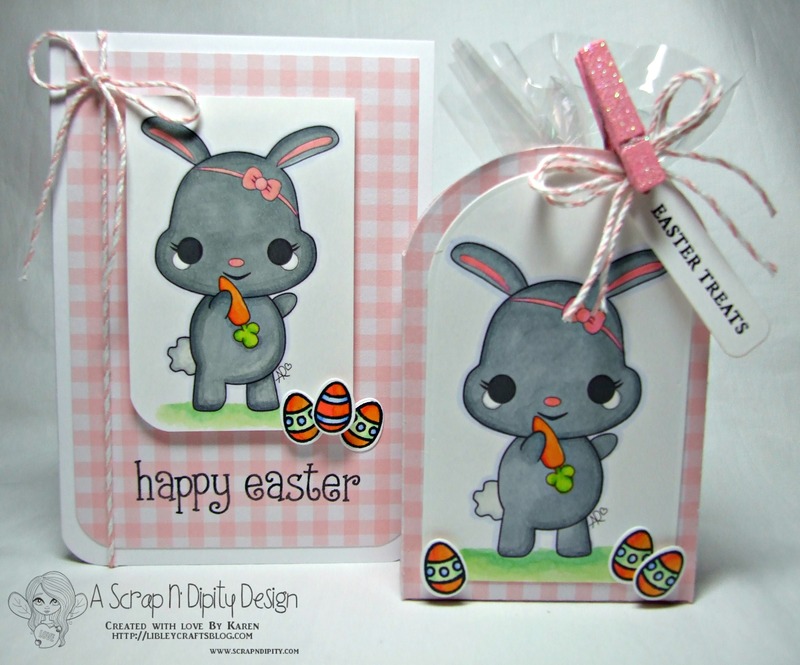 This is my first official DT post for Scrap N’ Dipity, and here are what I have created using this sweet image called Pinkee Bunny! I also used Lawn Fawn ‘Happy Easter’ stamps and dies, Reverse Confetti Tagged Tote Die, ‘Easter Treats’ stamp from Waltzingmouse Stamps, twine, gingham cardstock and Spectrum Noirs to colour. I really hope you’ll join us in our challenge, so why not head over to the Scrap N’ Challenge blog to check the rules and to see what the rest of the design team have created for you. < Previous Chilly Willy Bella…..
Oh Karen, this just couldn’t be any sweeter!!!! Live the pretty spring colors and how you used that clothespin!! Adorable!!!!! What a darling set, great for your first DT post! This store is new to me, heading over for a look straight away! Darling little treat bag and card. This bunny is super sweet, great coloring.